Hephesto's Forge: 2015 - VII - More distractions! 2015 - VII - More distractions! 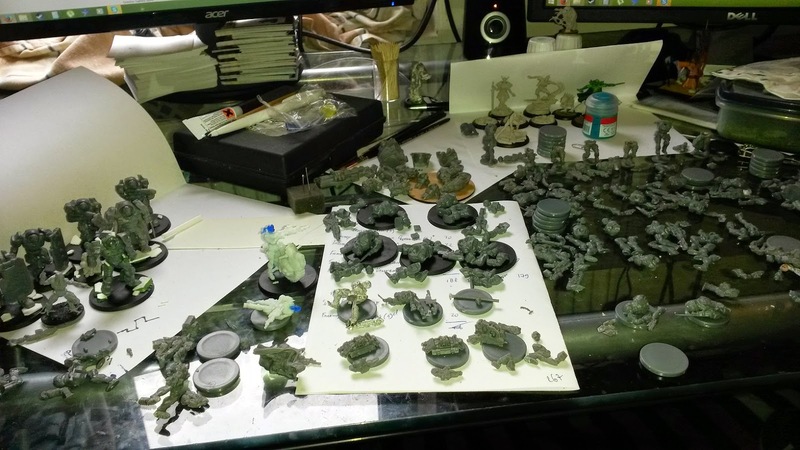 Well not a lot of painting progress these last two weeks, the Mantic Infestation Kickstarter was rather distracting. In fact it got me motivated to build up all my Deadzone Enforcers, of which I apparently have a ton of models around. Tons of slicing, dicing and moldline removal. 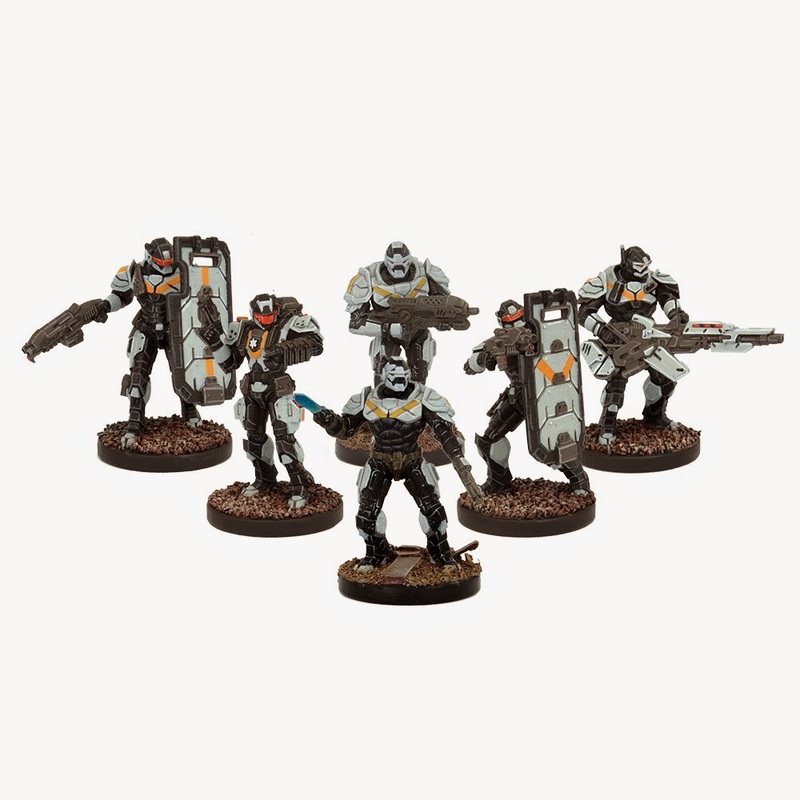 Rather cool how Mantic now has a hard plastic sprue for regular and Peacekeeper Enforcers that come with tons of bits. 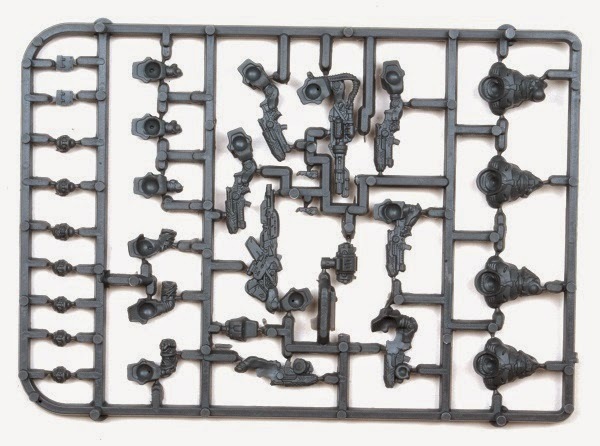 Essentially both sprues will give you options to build almost all the available minis for Deadzone, or a legal units for Warpath. Win-win situation in my book, not in the least as all those bits scale perfectly with the old restic models. So some of those extra / spare heavy weapons can just get glued on to some of the new bits, offering you even more options for Deadzone. And the regular Enforcers support booster. 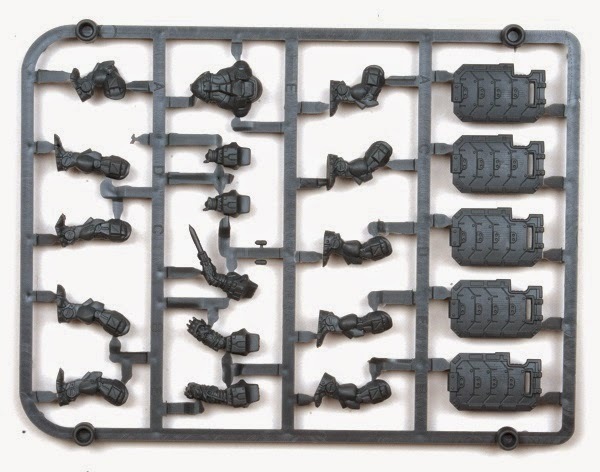 This is a bit of a special case as you get a sprue to make five hard plastic Enforcers with various weapon options, but it also comes with two restic shields to make Defenders (who cound as troops jeej!) and multipart, restic medic. So that makes for six models, one 'stuck' as the medic, while you can build anything you want with the rest (link). We're talking some very competent plastics here, with tons of extra bits and hardly any visible mold lines or mold lines in tough to reach places. 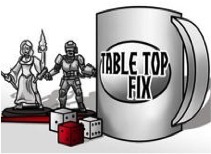 Bits that are supposed to go together, like torso and kneeling legs, are also clearly marked on the sprues with letters. At the same time there's also enough room, both in actual bits and easy to cut up joints, to get a lot of variety in gear and poses out of these if you pick up multiple sets. If there'd be something to complain about it would be that the Peacekeepers come with five combat shields. As far as I'm aware you'll never need that many in Deadzone, as they are specialists and expensive, while there's no word on a full shield unit in Warpath. The space could have been used for more conversion bits. That said Warpath is set for a major update somewhere around the end of the year, so they may end up being extremely useful. At the very least the shields look very cool. 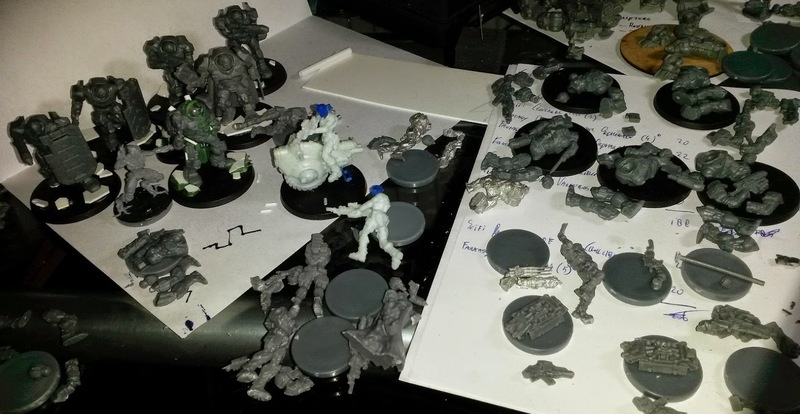 I've picked up a bit of a habit of building or painting a little something special for every Mantic Kickstarter. 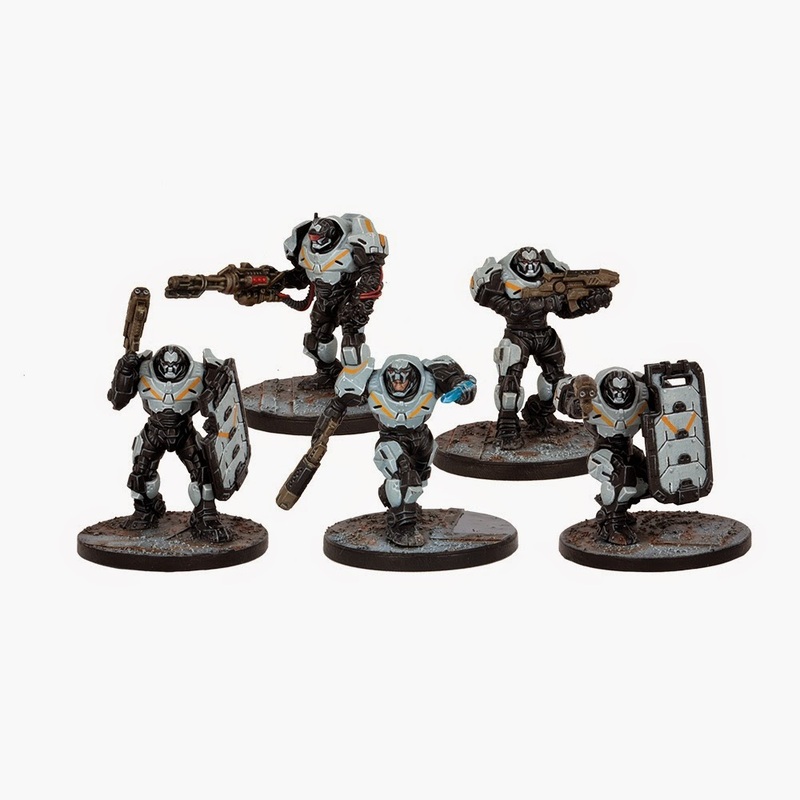 While I was putting together the Peacekeepers it struck me that with a bit of conversion work the silhouette of the model would be very similar to Starcraft Marines. So looks like I'm converting one into Starcraft II's Tychus Findlay. In fact another sprue has been added to my Kickstarter stuff for Infestation, so eventually there's going to have to be a Firebat as wel! Mostly putty work on the model to give it a bulkier look, while a Counterblast domed helmet was a perfect fit for the helmet (link). Knew those lovely, pulp scifi helmets would come in useful for more things than just Counterblast. Right, back to more slicing, building and actually trying to finish some models for the next update. Adding models to the pile is cool, getting them properly painted and ready for gaming is even better. While I find the miniatures visually appealing, I was a bit disappointed by the quality of the plastic from the previous kickstarter. Cleaning them would mean destroying details. They reminded me a bit of Sedition Wars, where cleaning and resculpting would take more work than painting. Anyway, I like to see how yours turn out. Am I correct to assume yours are all hard plastic on sprues from Warpath? The softness of the plastic is indeed a bit different than say GW sprues. 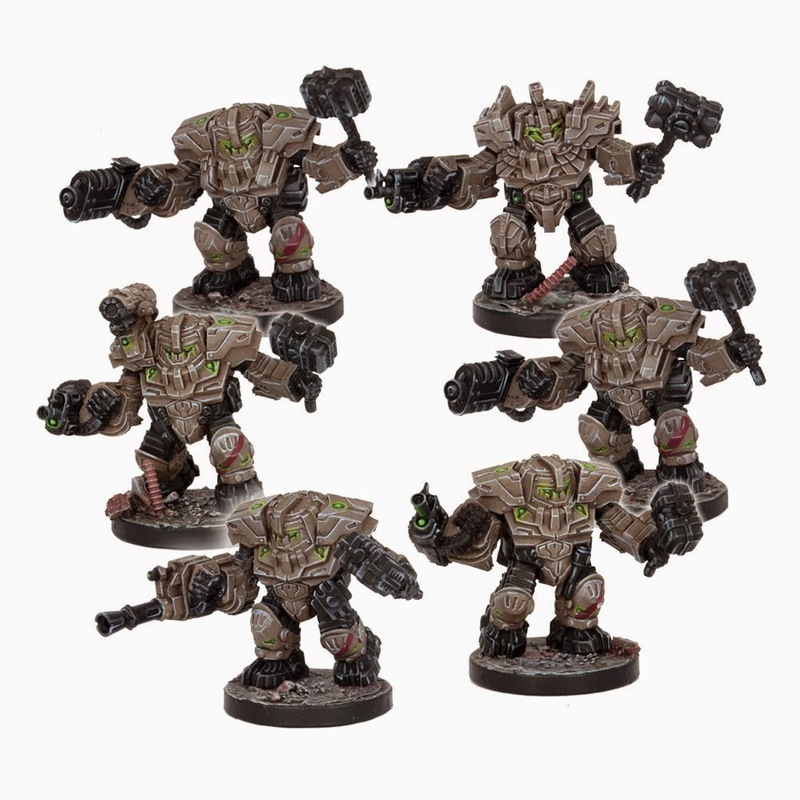 It's a big step up from the restic minis, though does weren't all too bad once you (and Mantic) got used to them. Much like the restic, slicing rather than scraping off moldlines seems to be the way to go here. It is rather interesting though how the terrain and miniatures sprues seem to use different plastics. The terrain stuff is a lot sturdier and tougher to cut up, though I doubt that mix would be ideal for the smaller, sharper detail of the miniatures. Most of my Enforcers stuff will indeed be plastic now as a result of a double sets of regular sprues and having picked up two sprues of Peacekeeper armour. Couldn't resist at the cheap buying price during the Kickstarter. 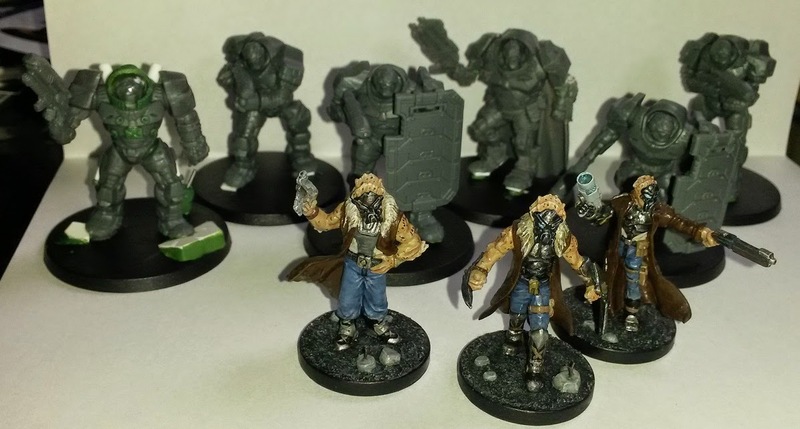 - Seven converted restic bodies with plastic arms & heads. Should be interesting to see how well they all hold up once finished, just give me 2-3 months ;-) Luckily actually getting 70 points to play them in Deadzone won't take nearly as long.